Australian Captain Michael Clarke made a brilliant triple hundred against India in the on going test match against India thereby joining the list of cricket most valued legends to score a triple hundred. Scoring a Triple Hundred in test matches is never easy at all! No matter against which opposition you play Triple Hundred counts. Australian team were considered out of form and cricketing legends expected Indian team to walk over with historic win in Australian soil. But the youngster James Pattinson and the roaring legend Ricky Pointing gave India run for the money. 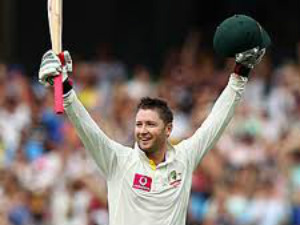 Michael Clarke is currently the 25th Batsman in Cricketing History to score triple hundred in test matches. Harrison pitches 6 scoreless innings! Previous: Iran vs. US, What is Going On ?